“We’re the Ghetto Priests from Nova Scotia. It’s nice to be back,” quipped Thurston Moore about 25 minutes through Chelsea Light Moving’s set. 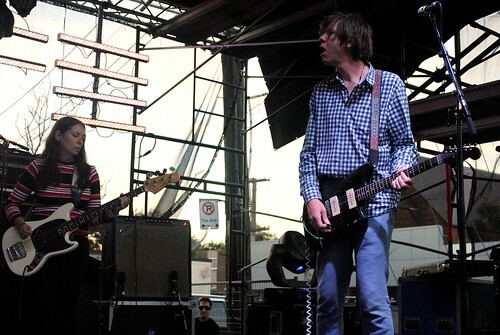 Towering over the crowd from atop just the modest stage at the back of the Horseshoe, it was the first time the Sonic Youth founder had acknowledged the Toronto audience directly that night. But with a strap reading “THURSTON” cradling the forest green Jazzmaster that Fender hot-rodded out in its wearer’s name – as if appearance was the only thing fans could go on – there was no question as to who was standing before them. The guitarist’s presence is not the kind to escape recognition; even when he hung back at stage left to concentrate on assaulting his amp with a load of feedback, Moore’s situation at the Horseshoe was undeniable, especially with his new band. 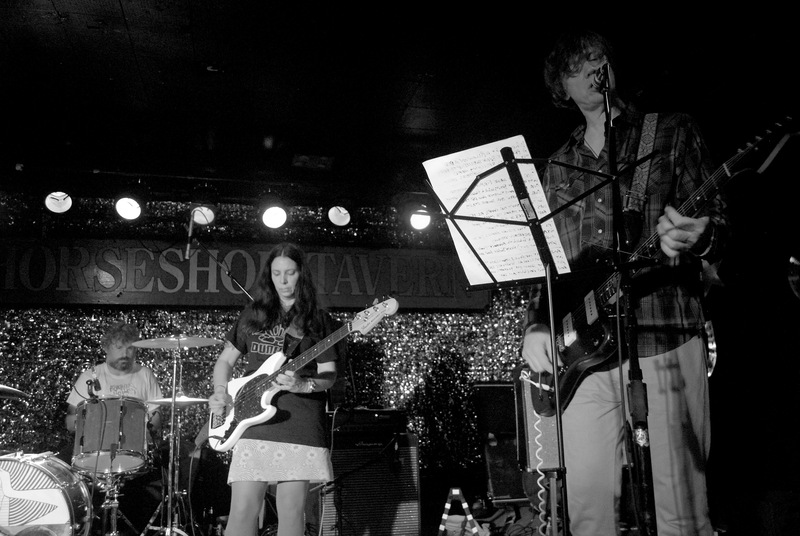 Whereas Sonic Youth offered listeners a dialogical sound democracy of which Thurston Moore was just one of four loud voices, Chelsea Light Moving is a puppet (albeit a dynamic, multi-brained one) under Moore’s guitar testing hand, and the live show made that resonate with a roaring ferocity. Chugging through a set filled with songs culled from the group’s eponymous debut, as well as new tracks “Sunday Stage,” “No Go” – apparently the “theme song” to a new board game to “be made from wood, plastic, and meat” that the band is working on “since nobody buys records anymore,” if you take Moore’s word for it – and an interpretation of 16th-century poet John Donne’s “The Ecstasy,” (full setlist below) the band’s set was heavy on noise improv, but all under the directive gaze of its most famous member. Even when guitarist Keith Wood was slashing away with picks that struck below the bridge, above the nut, and anywhere else that could render sounds from his own Jazzmaster, it was while awaiting nods and “1, 2, 3”s from Moore. When the time came and the crowd collectively clapped for an encore, whether intentionally or not, one fan articulated their leader’s surname into a double-entendre, incessantly screaming “Moore!” (or “More!”). This continued until the icon ducked through the steps and back up to the stage to answer the supporter with, well, more Moore – and not exactly the Chelsea Light Moving kind; with CLM bassist Samara Lubelski switching to her violin (an instrument she was called to play on Moore’s Demolished Thoughts), the band’s encore performance was focused exclusively on churning out extended jams of “Staring Statues” and “Ono Soul” from their leader’s ’95 solo effort, Psychic Hearts. This entry was posted in Burden of Salt and tagged "The Ecstasy", Chelsea Light Moving, fender, Horseshoe, Horseshoe Tavern, jazzmaster, John Donne, Matt Robidoux, Ono Soul, Psychic Hearts, Sadie Dupuis, Samara Lubelski, setlist, Sonic Youth, Speedy Ortiz, Staring Statues, Thurston Moore, Toronto on September 17, 2013 by Tom Beedham.